Mongolia (i/mɒŋˈɡoʊliə/; Mongolian: Монгол улс (help·info), literally means Mongol country/nation) is a landlocked country in East and Central Asia. It is bordered by Russia to the north and the People's Republic of China to the south, east as well as west. 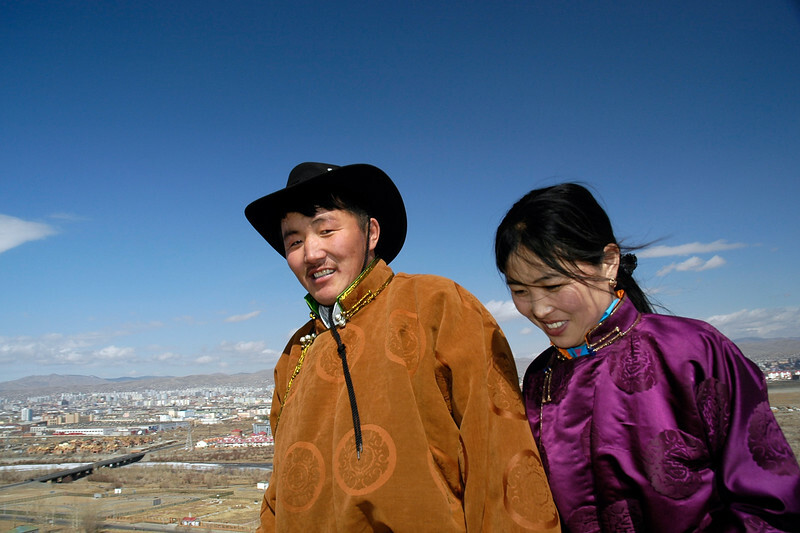 Ulan Bator, the capital and largest city, is home to about 45% of the population. The area of what is now Mongolia has been ruled by various nomadic empires, including the Xiongnu, the Xianbei, the Rouran, the Gökturks and others although the Mongol Empire was founded by Genghis Khan in 1206. 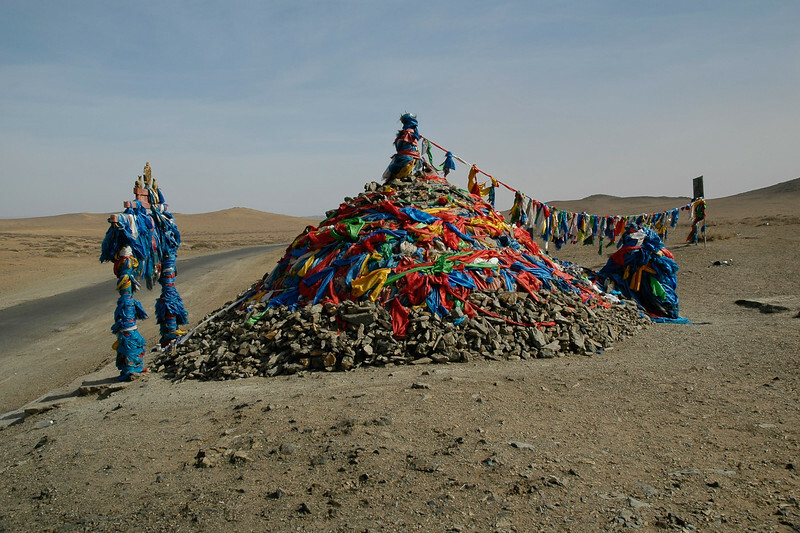 In the 16th and 17th centuries, Mongolia came under the influence of Tibetan Buddhism. 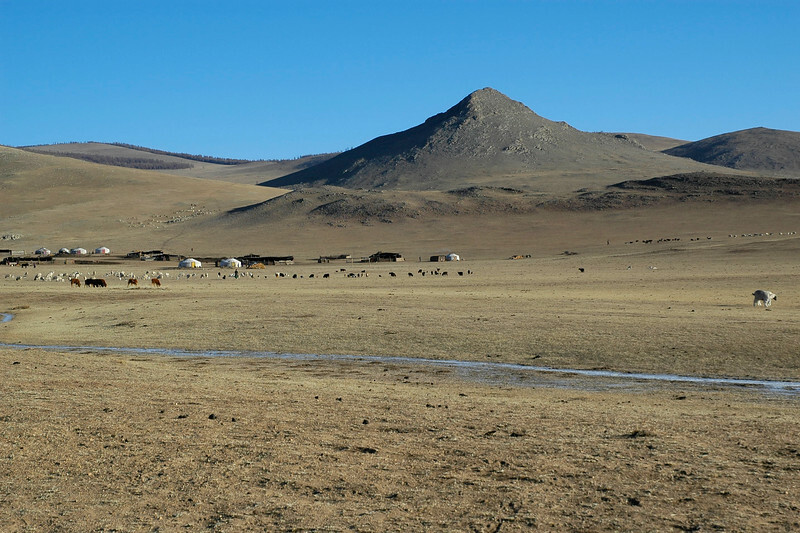 At the end of the 17th century, most of Mongolia had been incorporated into the area ruled by the Qing Dynasty. During the collapse of the Qing Dynasty in 1911, Mongolia declared independence, but had to struggle until 1921 to firmly establish de facto independence from the Republic of China, and until 1945 to gain international recognition. As a consequence, it came under strong Russian and Soviet influence; and in 1924, the Mongolian People's Republic was declared. 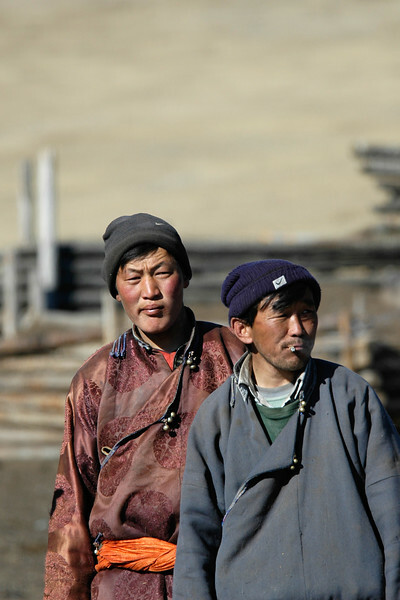 After the breakdown of communist regimes in Eastern Europe in late 1989, Mongolia saw its own Democratic Revolution in early 1990, which led to a multi-party system, a new constitution in 1992, and transition to a market economy. 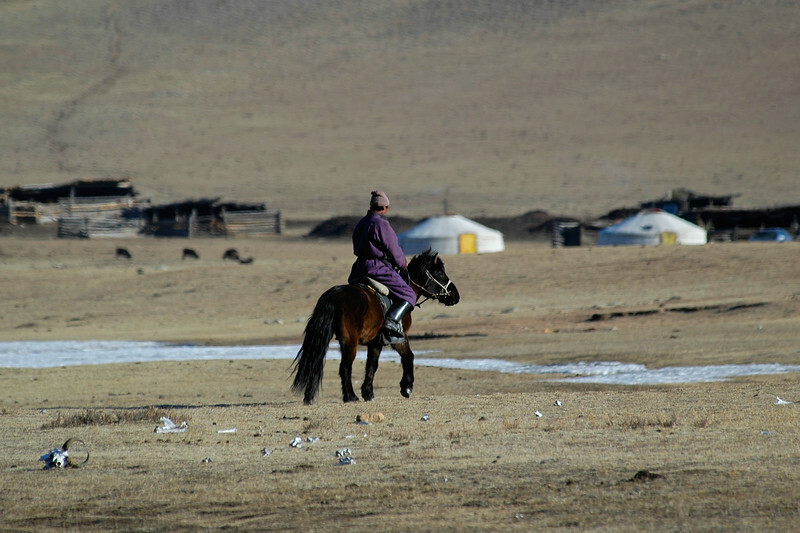 At 600,000 sq mi, Mongolia is the 19th largest and the most sparsely populated independent country in the world, with a population of around 6 million people with over half living in the capital city. 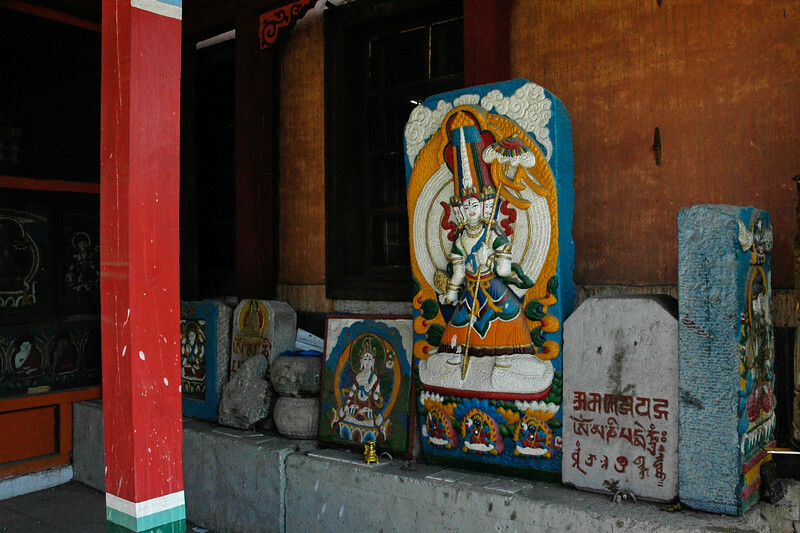 Approximately 30% of the population are nomadic or semi-nomadic with the predominant religion being Tibetan Buddhism. About 20% of the population live on less than US$1.25 per day. The Megjid Janraisag. The Megjid Janraisag statue of Buddha was built to commemorate the independence from Manchu proclaimed in 1911. Unfortunately, the magnificent Megjid Janraisig was destroyed in the late 1930’s, dissembled and transported to the Russia for manufacturing cartridges during the WWII. Historians still could find some parts of this relict art in museums in Russia. After the fall of the communist regime in Mongolia the people started a campaign for rebuilding of the Megjid Janraisag. Completely by people’s donations the statue was rebuilt and become once again the main praying point representing Mongolia’s sovereignty. 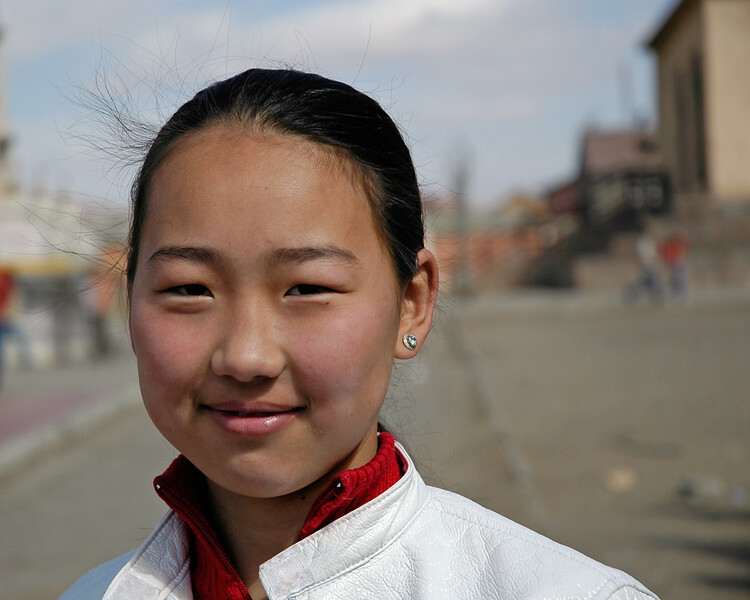 Mongolia, despite experiencing religious oppression during the communist era, remains a primarily Buddhist nation. 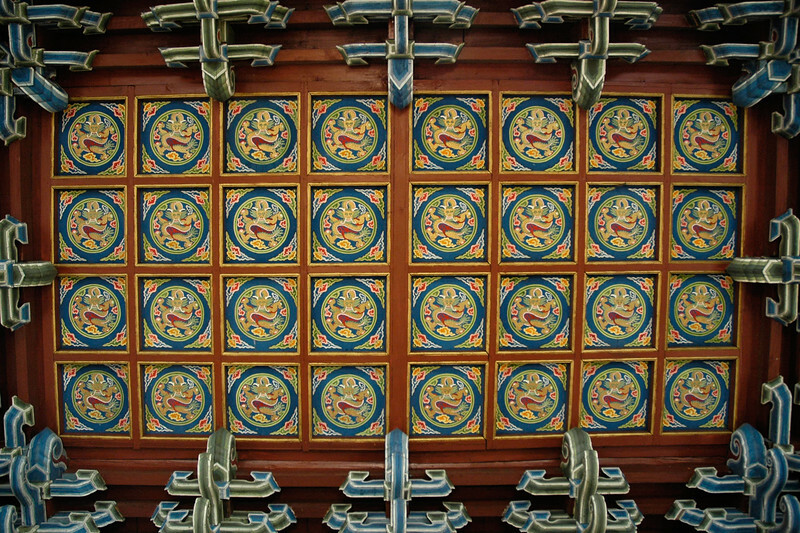 Intricate work done on the wooden ceiling with Buddhist inscriptions. 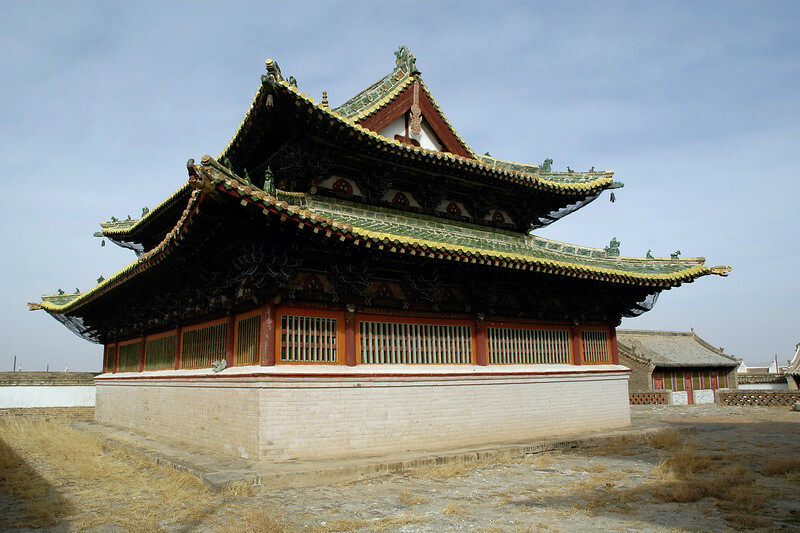 Gandan Monastery is one of the most significant ones in Mongolia. UB, Ulaan Baator, Mongolia. Inner prayer room. 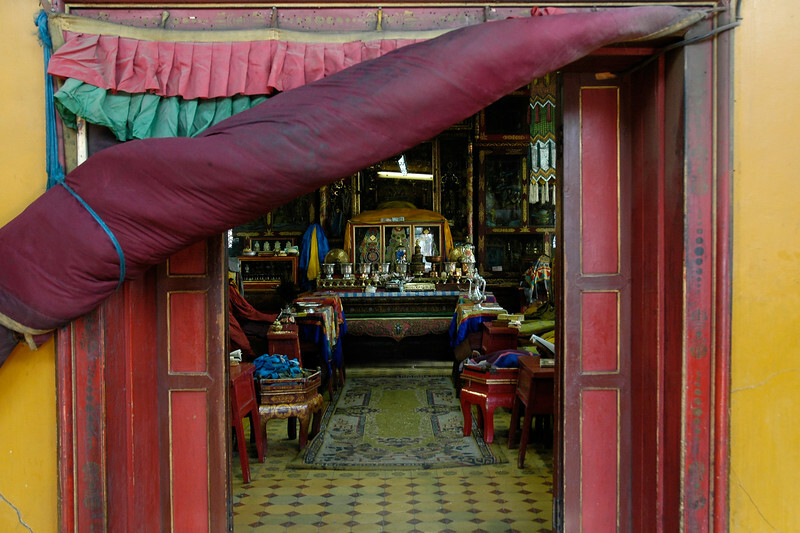 Gandan Monastery is one of the most significant ones in Mongolia. UB, Ulaan Baator, Mongolia. Chanting, music and prayers. 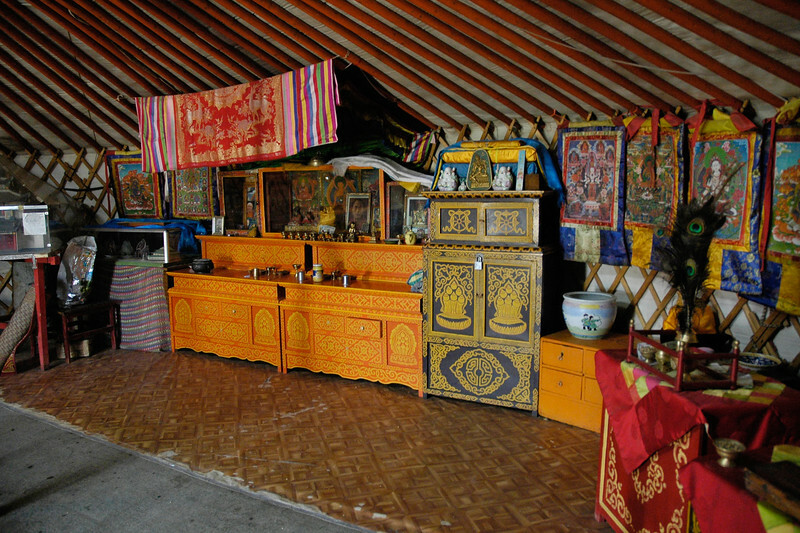 Gandan Monastery is one of the most significant ones in Mongolia. UB, Ulaan Baator, Mongolia. 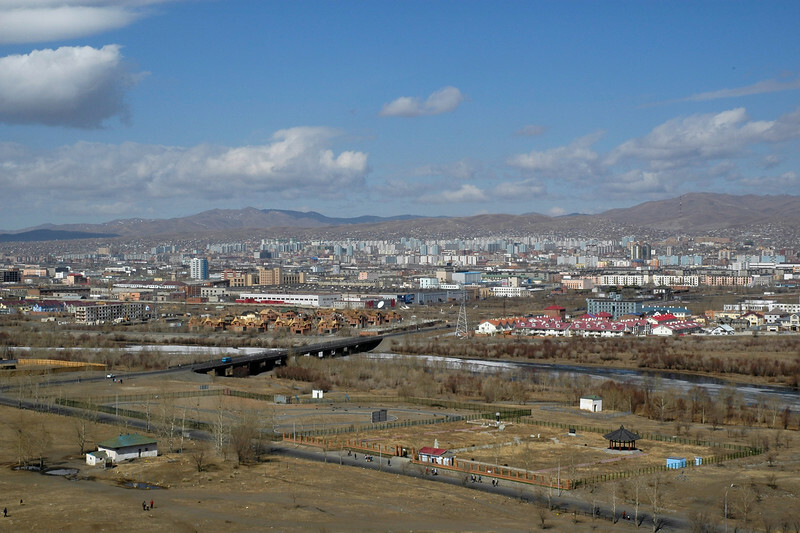 Ariel view of UB (Ulaan Baator), Mongolia from Zaisan Hill. Zaisan Hill Memorial was erected on the occasion of 50th anniversary of Mongolia Independence and honors the Soviet and Mongolian soldiers who died in WWII in the fight against Japan and Nazi Germany. The Memorial provides impressive view over the whole capital city. 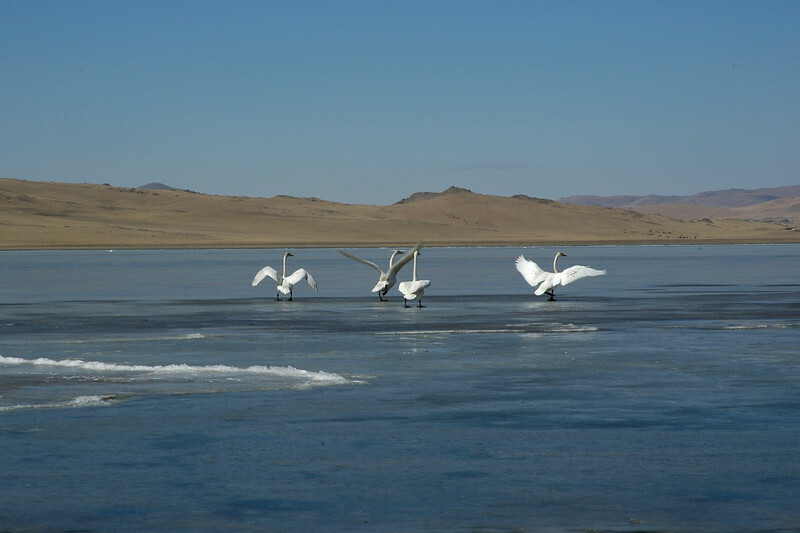 Frozen Tuul River (nuur as its called in Mongolia). Zaisan Memorial. 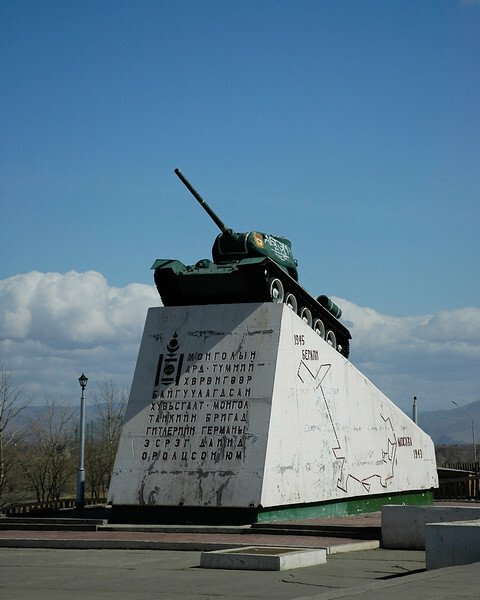 Located to the south side of Ulaanbaatar is Zaisan Hill Memorial which was erected on the occasion of 50th anniversary of Mongolia Independence and honors the Soviet and Mongolian soldiers who died in WWII in the fight against Japan and Nazi Germany. 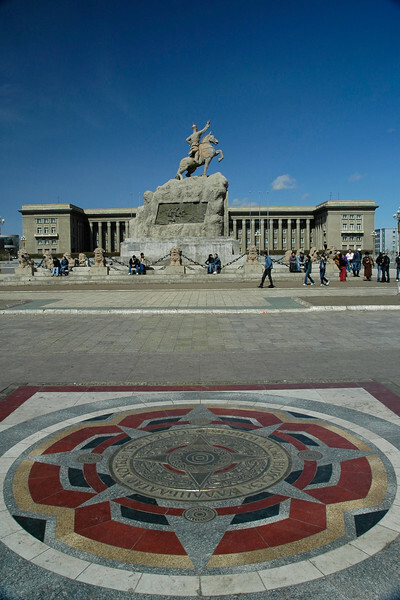 Next to the monumental statue of the soldier, a mosaic composition on a large circular panel in reinforced concrete illustrates the theme of friendship between Mongol and Soviet peoples. In the center of it a large granite bowl holds an eternal flame. The Memorial provides impressive view over the whole capital city. Tank on display at Zaisan Memorial. 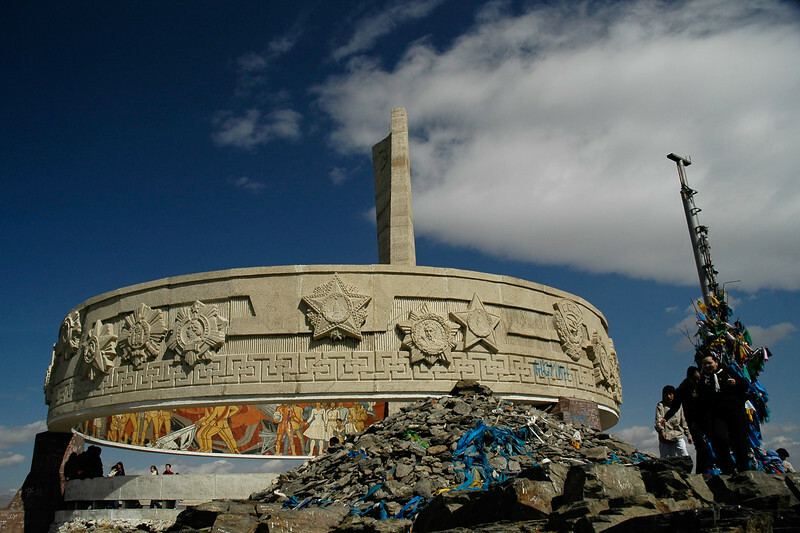 Located to the south side of Ulaanbaatar is Zaisan Hill Memorial which was erected on the occasion of 50th anniversary of Mongolia Independence and honors the Soviet and Mongolian soldiers who died in WWII in the fight against Japan and Nazi Germany. Next to the monumental statue of the soldier, a mosaic composition on a large circular panel in reinforced concrete illustrates the theme of friendship between Mongol and Soviet peoples. In the center of it a large granite bowl holds an eternal flame. The Memorial provides impressive view over the whole capital city. Sukhbaatar Square is the heart of Ulaanbaatar where the Parliament, the Government House, Stock Exchange and many other important establishments are concentrated. 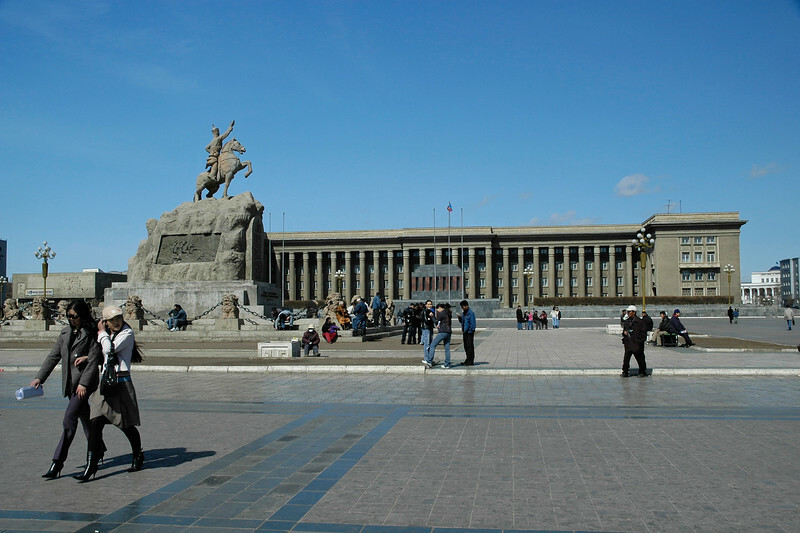 The square is named after Sukhbaatar, the famous patriot, whose statue is the main attraction on this square. 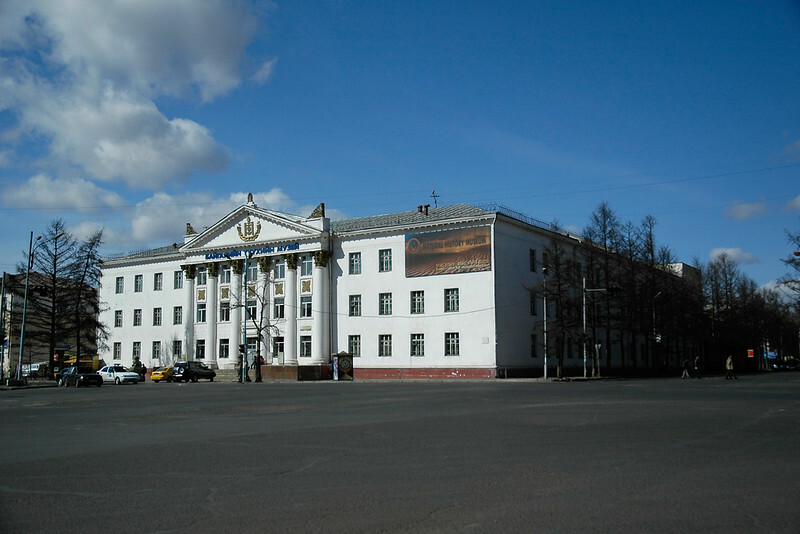 Natural History Museum building, UB (Ulaanbaator), Mongolia. 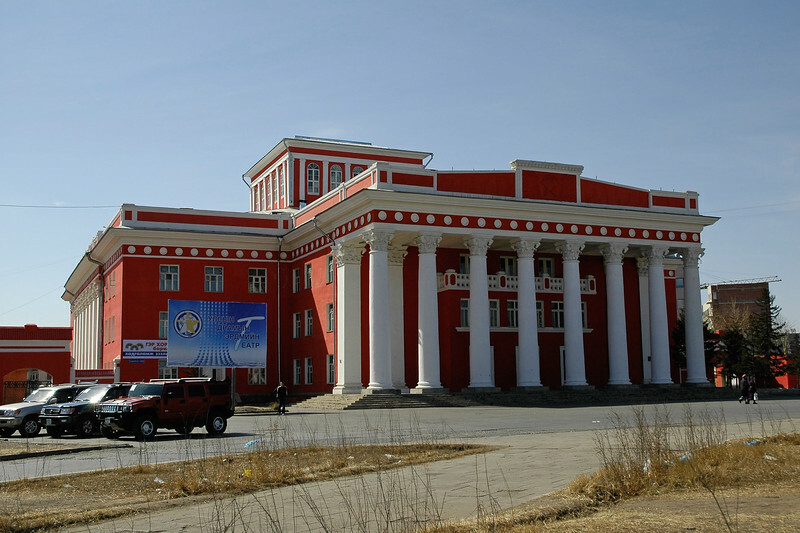 The Museum was founded in 1924 and exhibits Mongolia's history, culture, and economic development as well as highlights the natural wealth. Inside are two complete dinosaur skeletons (Tarbosaurus, 15m tall and 5 tonnes in weight) which were found in Gobi. National song and dance assembly building UB (Ulaan Baator), Mongolia. 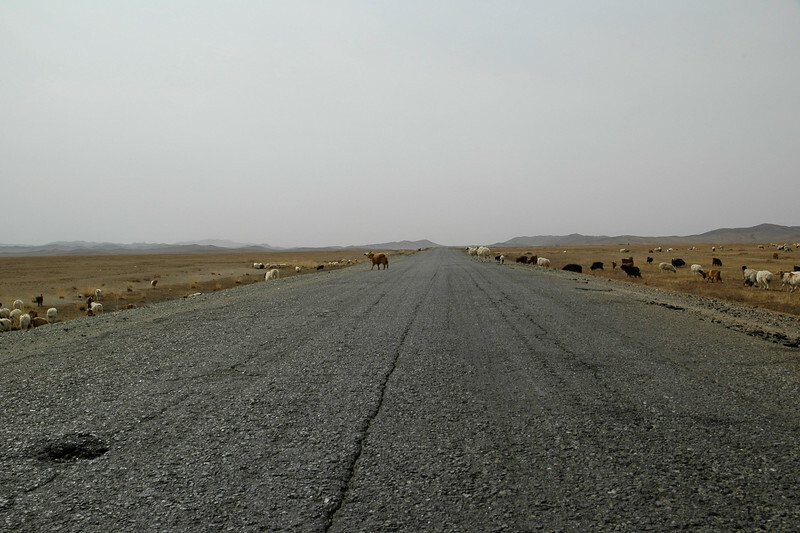 Long and empty roads on the Mongolian highway. Back on the road. 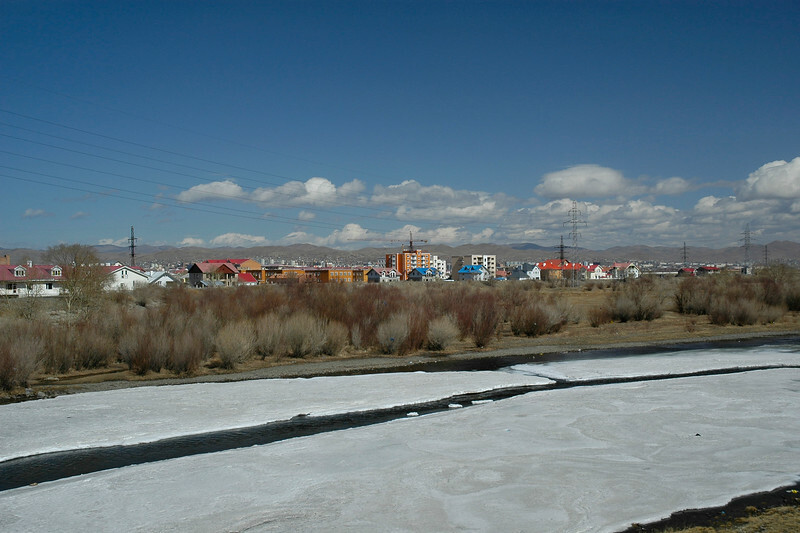 This time towards Erdene Zuu which is in Övörkhangai Province, in the town of Kharkhorin (near Karakorum). 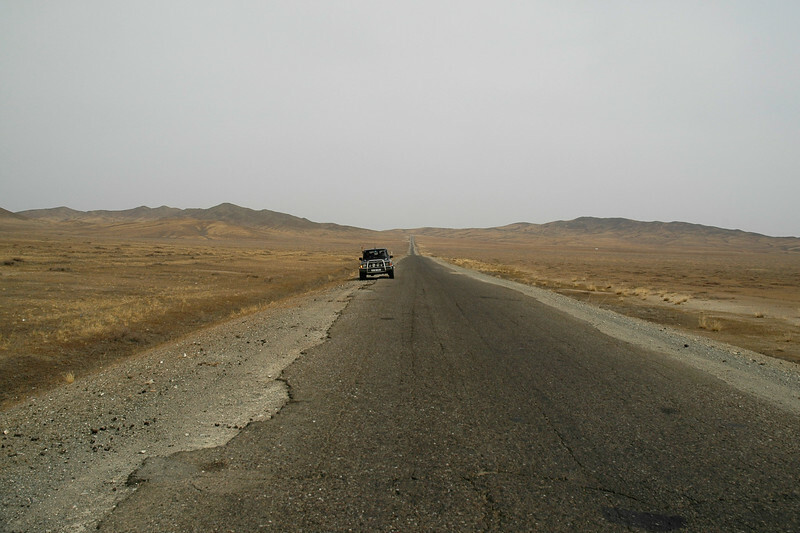 On the road towards Erdene Zuu which is in Övörkhangai Province, in the town of Kharkhorin (near Karakorum). 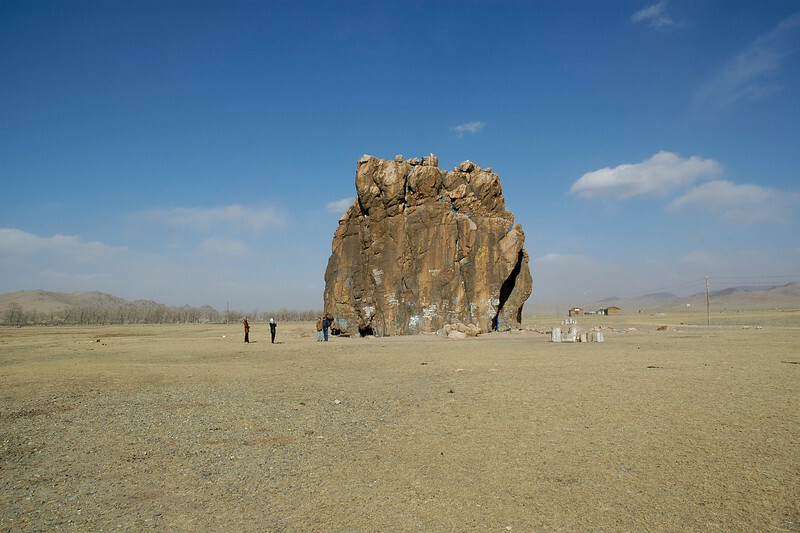 As we near Erdene Zuu Monastary which is in Övörkhangai Province, in the town of Kharkhorin (near Karakorum), we first come to this stone structure which is on a hill outside the monastery. 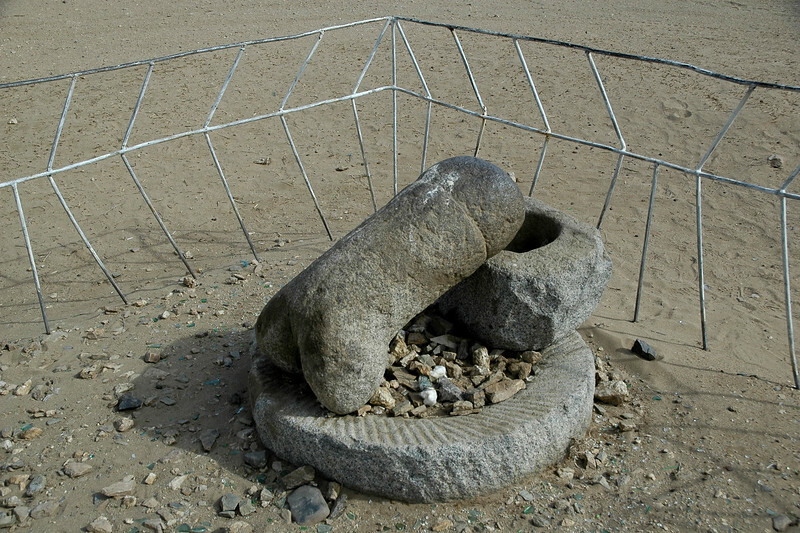 This stone phallus is said to retain the sexual impulses of the monks and ensure their good behavior. The story goes that monks who wanted to enter the monastary were supposed to mastrubate here and offer their last sexual energy to this stone organ. Others who were unable to get children would come here and pray and draw upon this energy. 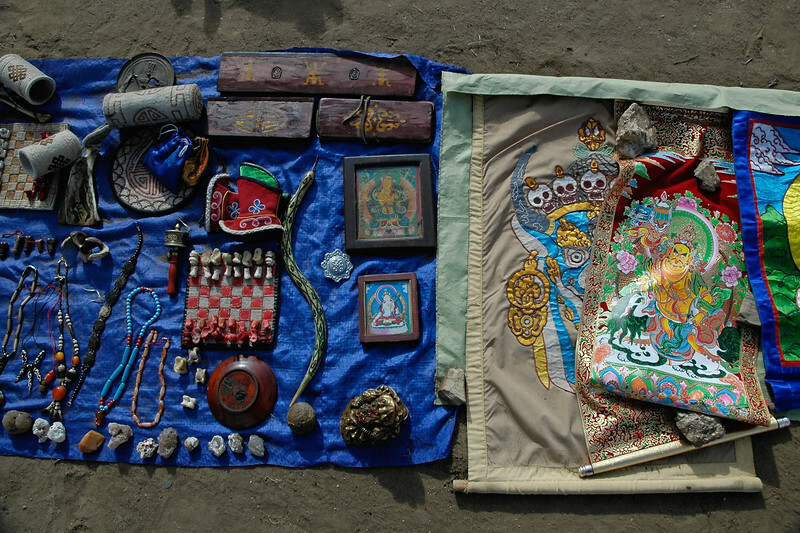 Assorted items on sale near Erdene Zuu which is in Övörkhangai Province, in the town of Kharkhorin (near Karakorum). 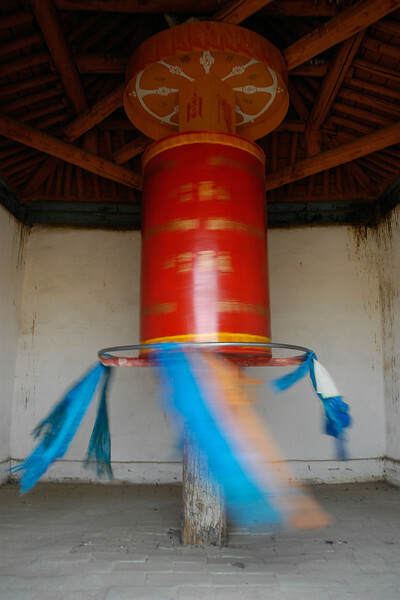 Prayer wheels at Erdene Zuu Monastary. 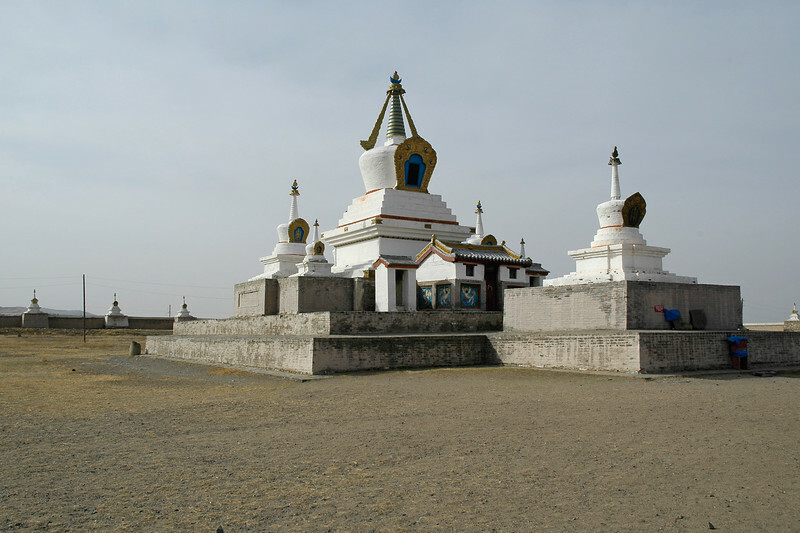 This Monastary is located in Övörkhangai Province, in the town of Kharkhorin (near Karakorum). Mongolia. 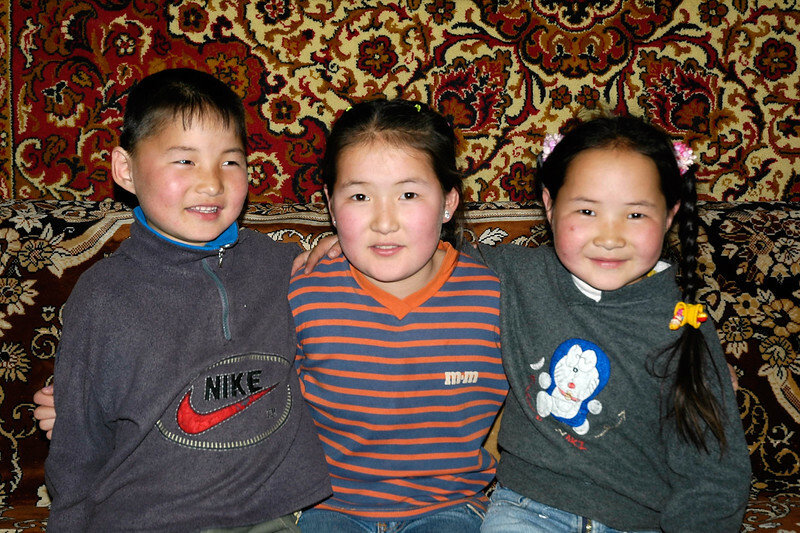 Lovely mongolian children at their home near Erdene Zuu Monastary in Övörkhangai Province, in the town of Kharkhorin (near Karakorum) Mongolia. 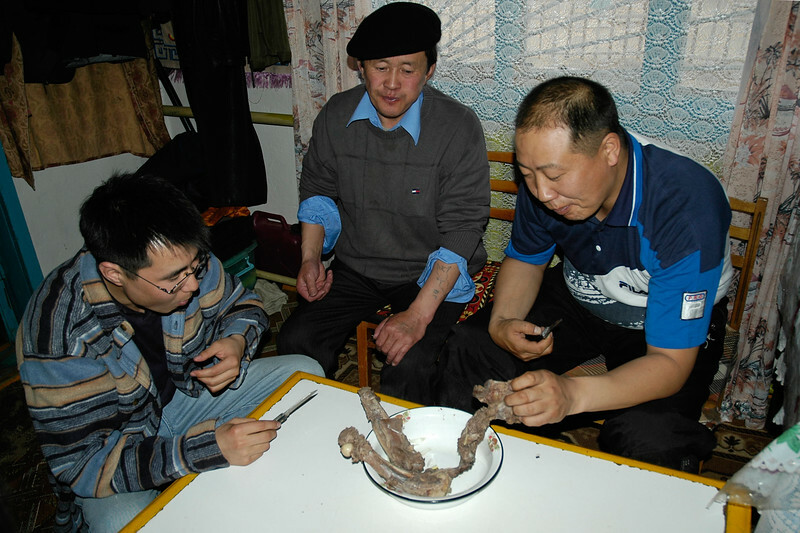 Dinner with Dr. Amarsaikhan Dash, Batpurev at a home near Erdene Zuu Monastary in Övörkhangai Province, in the town of Kharkhorin (near Karakorum) Mongolia. 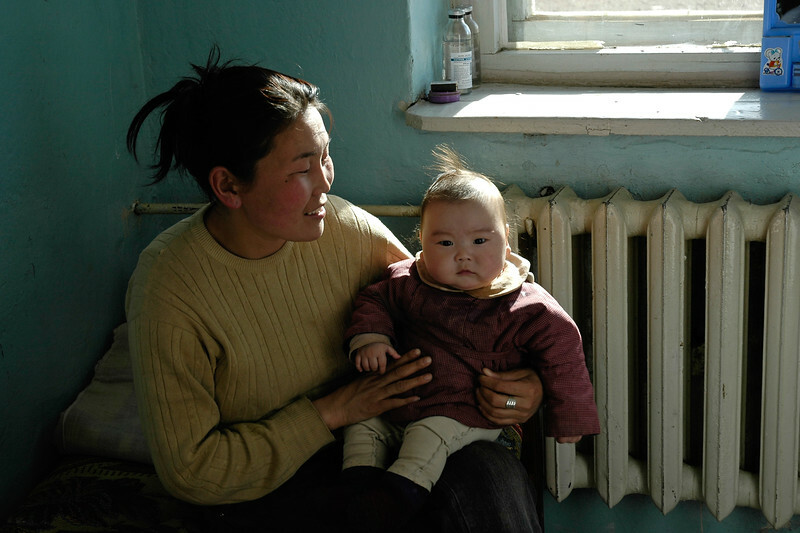 Small mongolian child with mother in Central Mongolia. 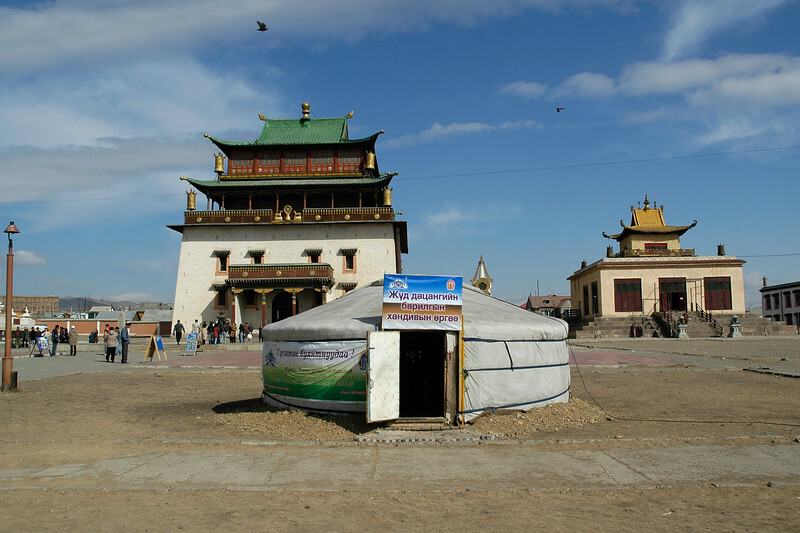 Mongolian Ger (Yurt with portable felt dwelling) with clear blue skies above and a vast expanse of land in Gobi desert. One can drive long distances without coming across any people or mammals. Occasionally one comes across a ger and a few family members. Rural Central Mongolia. 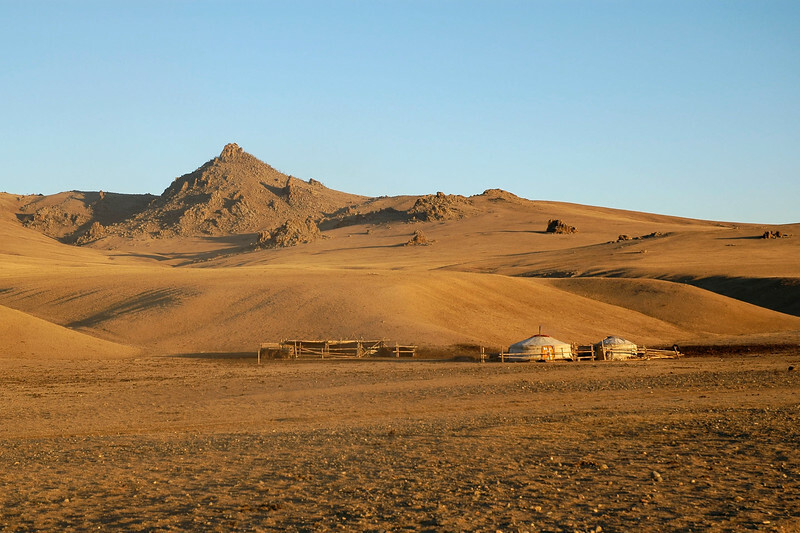 Mongolian Ger (Yurt) in Gobi desert. Central Mongolia. Traditional gers consist of a circular wooden frame carrying a felt cover. The felt is made from the wool of the flocks of sheep that accompany the pastoralists. The timber to make the external structure is not to be found on the treeless steppes, and must be traded. The frame consists of one or more lattice wall-sections, a door-frame, roof poles and a crown. Some styles have one or more columns to support the crown. The (self-supporting) wood frame is covered with pieces of felt. Depending on availability, the felt is additionally covered with canvas and/or sun-covers. The frame is held together with one or more ropes or ribbons. The structure is kept under compression by the weight of the covers, sometimes supplemented by a heavy weight hung from the center of the roof. They vary regionally, with straight or bent roof-poles, different sizes, and relative weight. It is designed to be dismantled and the parts carried on camels or yaks to be rebuilt on another site. 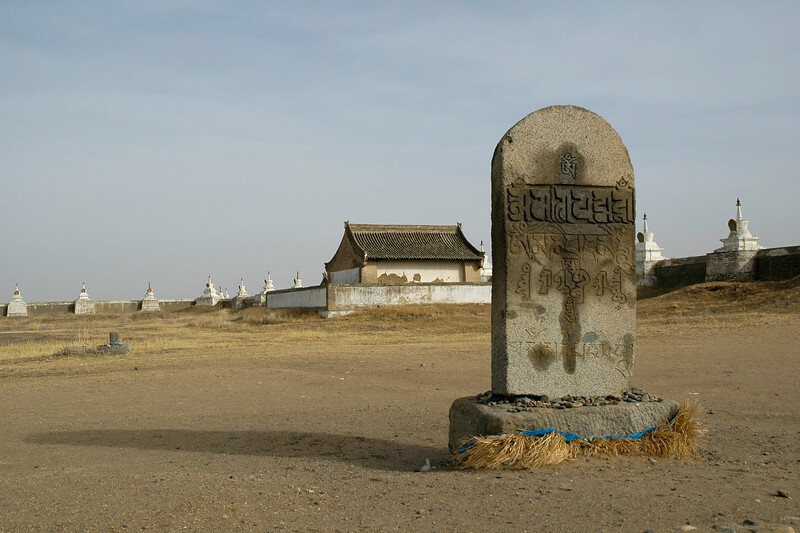 Stone tablet & inscriptions in Mongolian at at Erdene Zuu Monastary. 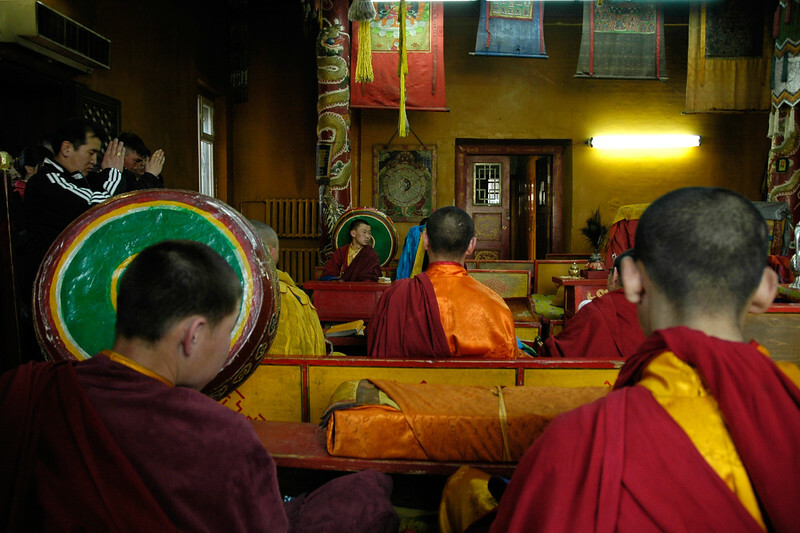 This Monastary is located in Övörkhangai Province, in the town of Kharkhorin (near Karakorum). Mongolia. Cattle grazing in the distance. Vast expanse of land with freezing temperatures and frozen pond/puddles. Gobi desert. Rural Central Mongolia. Added to the freezing temperatures, we had a dust storm in Övörkhangai Province, in the town of Kharkhorin (near Karakorum) Mongolia. 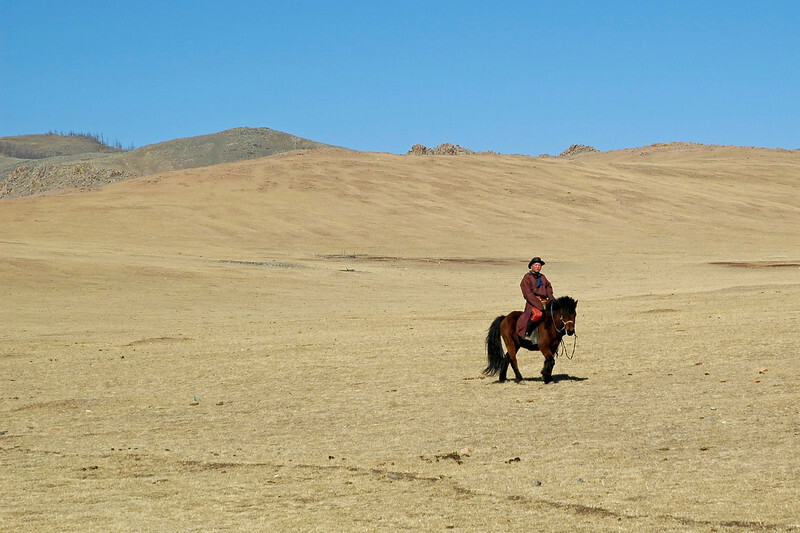 Mongolian rider with his horse. Also seen is a cluster of gers in the back. Living at great distances, its good to see an occasional human in the vast expanse of land while we were drive across long distances. Gobi desert. Rural Central Mongolia. In Mongolia it is believed that if you are spiritual, then only you get to see a wolf in the wild. But if you kill a wolf, you are higher than it. 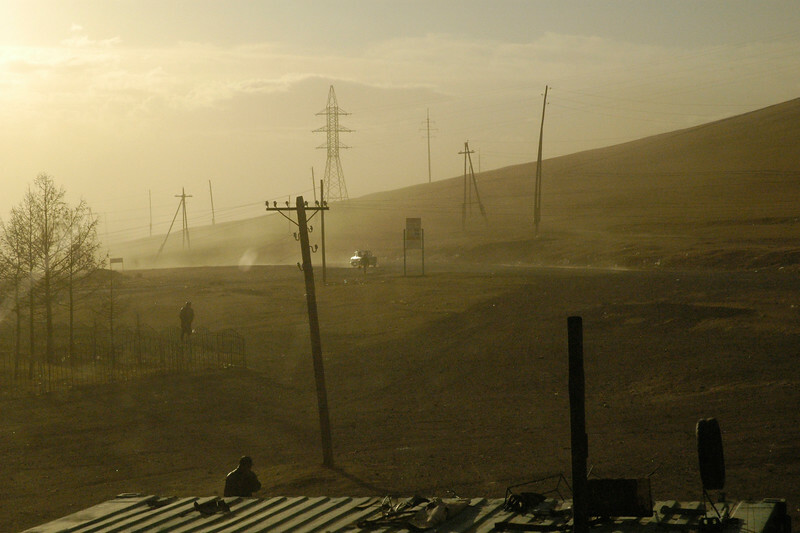 While driving across Gobi desert, hawk eyed Dr. Amarsaikhan Dash spotted a wolf and the chase began. While I didn't understand it quite well at that time, he drove off the normal track and wanted to run over the wolf. But the wolf was smart and kept dogging and turning - faster than the car could. 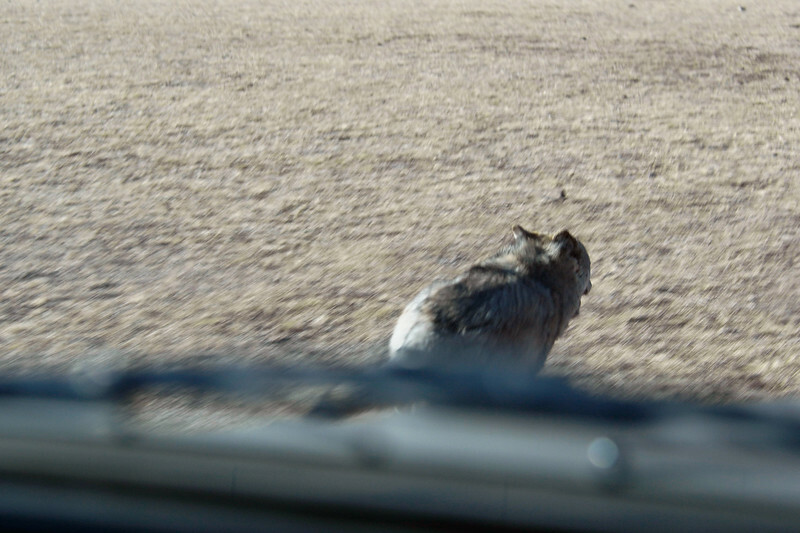 He was also fast and barely outran our car but it was its skill at the end so thank God the wolf made it to safety. I was shooting wild and had no idea what I got till we got back and reviewed the pictures. Dr. Amarsaikhan kept remembering for the next 1 hour his earlier chases and how he wished he had his gun with him. I was praying otherwise. Birds on the lake. Central Monglia. Our car in which we did the full trip in front of the "Lone tree" which looked a bit lonely. It was standing erect with no friends or family. Stopped to get a picture. Central Mongolia. 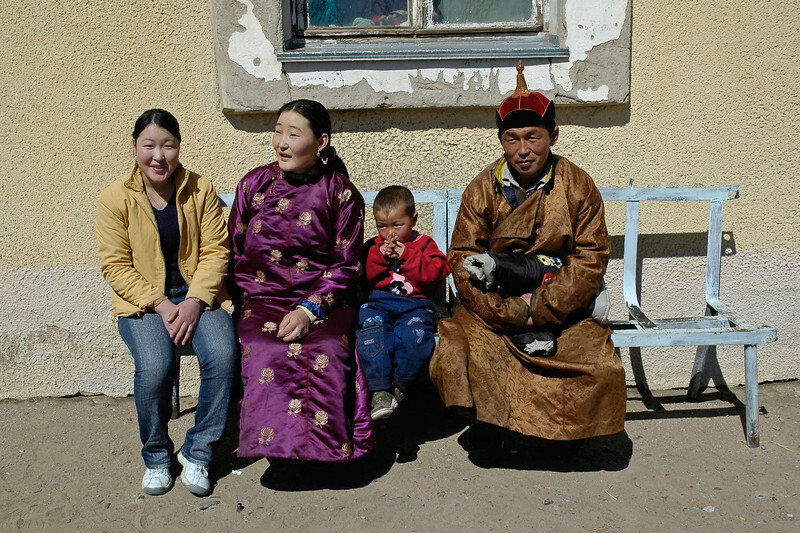 Portraits of family members outside a rural hospital in Central Mongolia. A few country Mongolians who we didn't know but they invited us over to their home (Ger). 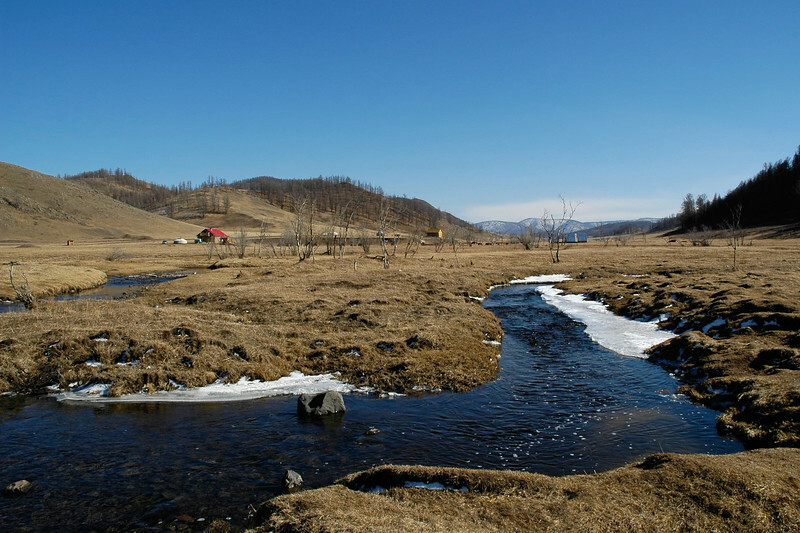 Dornogobi aimag, Urgun soum. 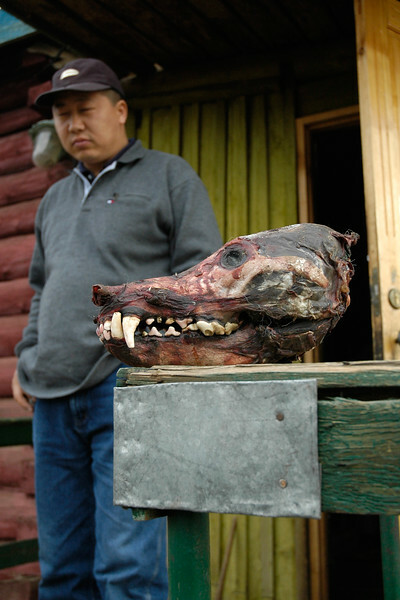 A skinned wolf head put at the front porch of the horse to ward off evil. In Mongolia it is believed that if you are spiritual, then only you get to see a wolf in the wild. But if you kill a wolf, you are higher than it. Dr. Amarsaikhan seen at the back. Gobi desert. Mongolia. Mongolian lady staff hostess at the lunch place at Erdenet. Central Mongolia. 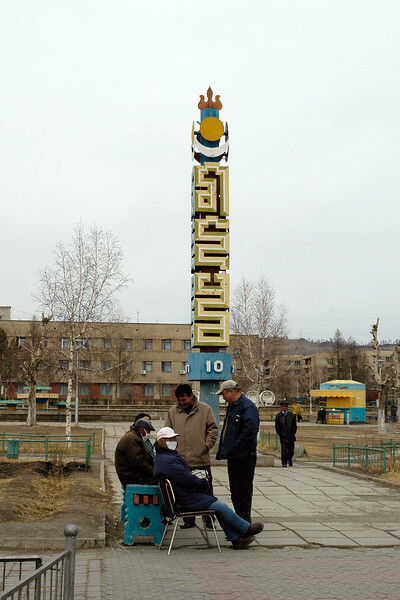 Street scene at Erdenet. 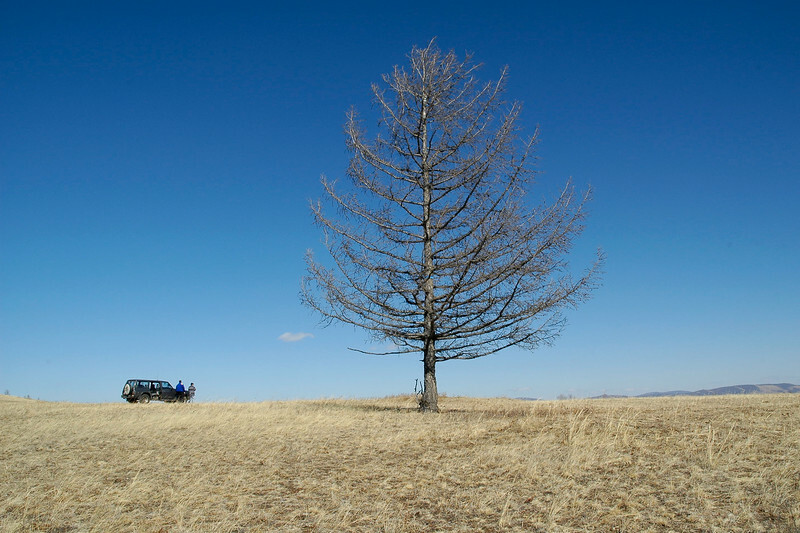 Central Mongolia. 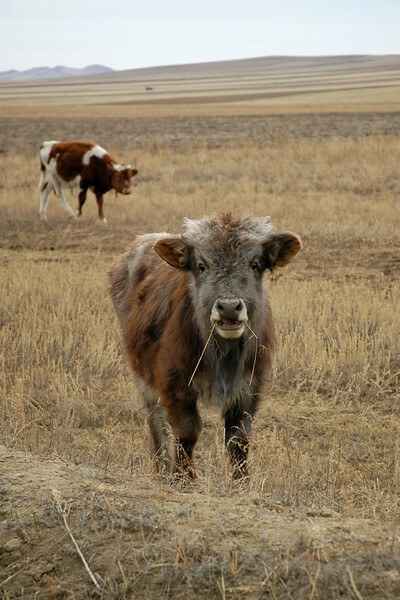 On the way into UB, Mongolia we could see a number of cattle lazily graze in the fields. I was told that people didn't have local heaters even in this cold. Hot water pipes circulated hot water through a public-system to keep the housing and office buildings warm. 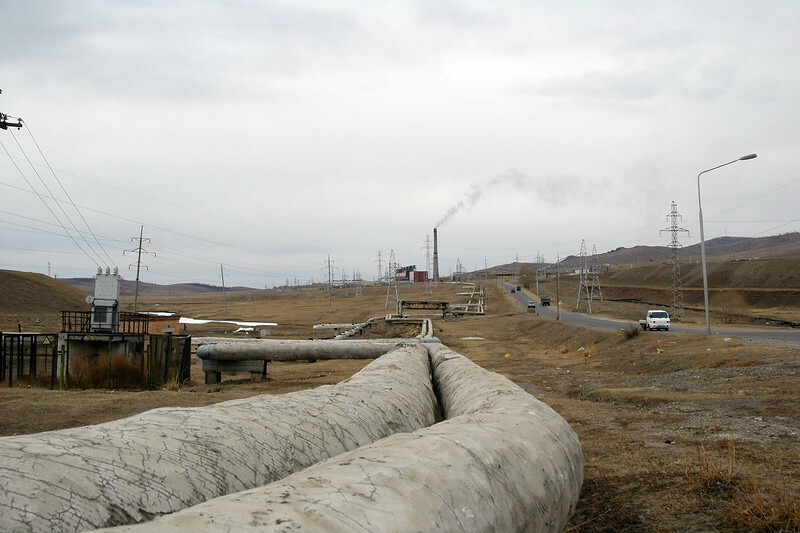 Seen is the protective clad pipes in UB (Ulaanbaator) Mongolia. Visited the Shri Atal Bihari Vajpayee Centre for Excellence in Information and Communication Technology (ABVCEICT) in Ulaanbaatar. 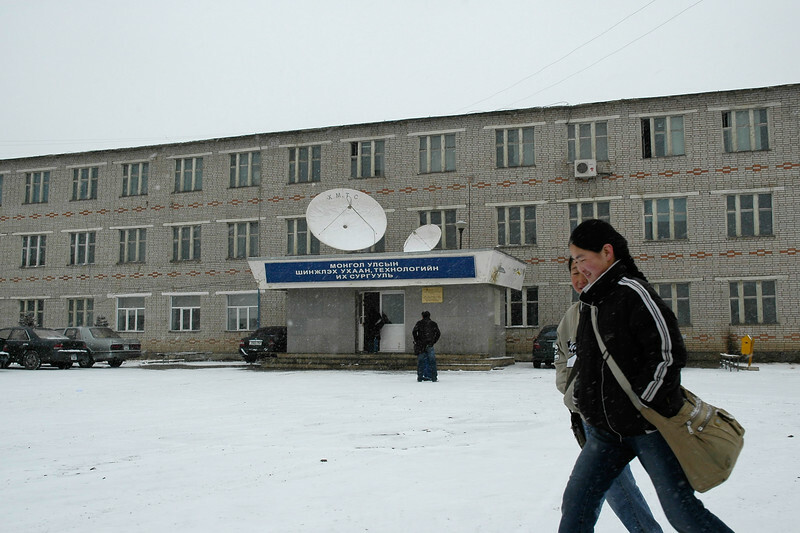 ABVCEICT which was setup in UB and proposed community centres in five provinces (which were to be connected by video conference) is doing well. Ulaanbaator (UB), Mongolia. 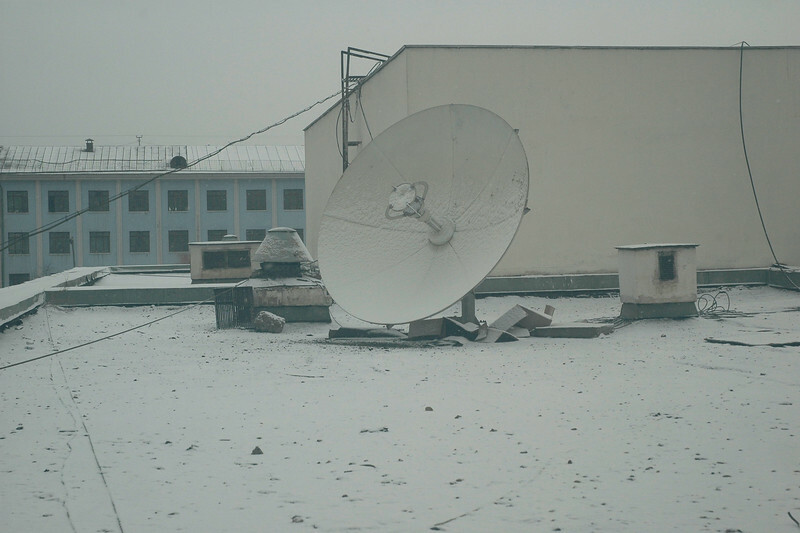 Satellite antenna covered by snow and ice. Ulaanbaator, Mongolia. 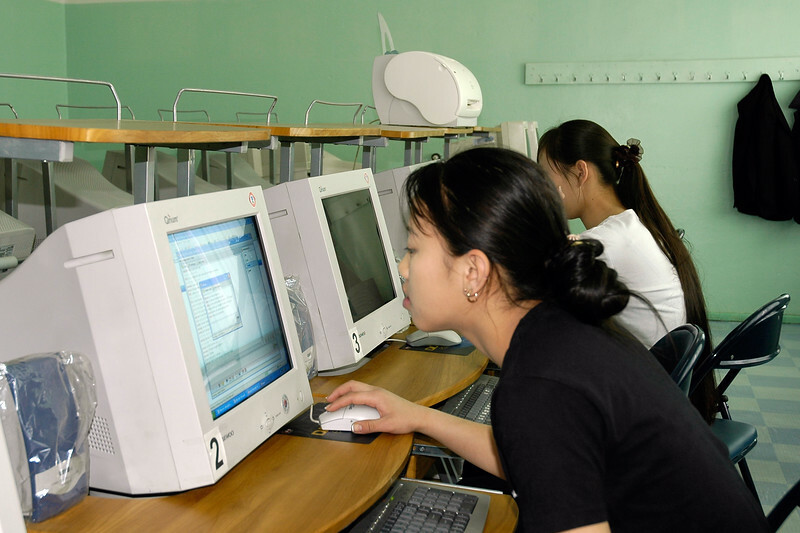 Seen here is their computer lab with students working on PCs. Visited a school in UB, Mongolia to see their facilities.